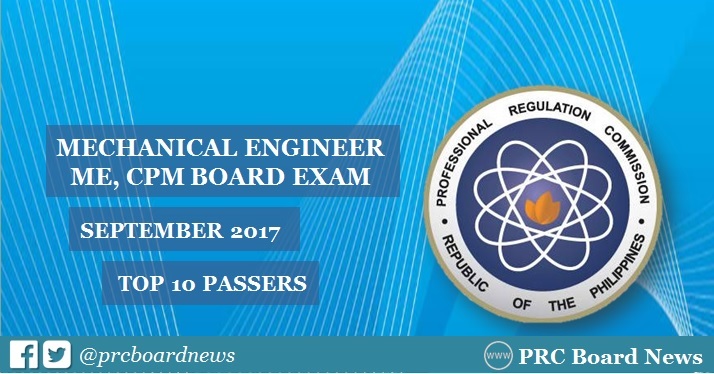 The September 2017 Mechanical Engineer (ME) and Certified Plant Mechanics (CPM) board exam top 10 or topnotchers together with other results - list of passers, top performing schools and performance of schools are out online on Tuesday, October 3, 2017 or in 3 working days after the exam. Jay Nelson Talip Corbita from Xavier University aced the board with 92.20%. It was followed by Von Eric Abag Damirez of University of Batangas (UB) with 90.15%. The Professional Regulation Commission (PRC) administered the licensure exam in the cities of Manila, Baguio, Cagayan de Oro, Cebu, Davao and Lucena on September 28 and 29, 2017. In the March 2017 ME board exam, Brylle Pahimutang Gilbuena from University of Cebu in Lapulapu and Mandaue topped the board with 88.10%. It was followed by Niño Rey Jacoba Caraig, graduate of Polytechnic University of the Philippines (PUP) - Maragondon with 87.80%. In the same period last year, Elso Umbao Elumbaring Jr. from Notre Dame University led the passers with 90.15%. Edcel Reblora Fortes from Sorsogon State College - Sorsogon ranked second with 89.40%. Here's overview of topnotchers for Mechanical Engineer board exam in the past 2 years. Mechanical engineering is hosted for the rightful means for the individuals. All the pores of the engineering and visits of the http://www.graduateadmission.org/undergraduate-application-for-haas-and-other-famous-schools/ are culminated for the humans. The portion is induced for the help of the ideal paths for the humans indifferent categories for the partners of the field. Results of mechanical engineering is published for the ease of the students. All the new engineers of the field and visits of the http://www.mbaessaywriting.org/our-services/mba-application-essay-service/ are charged for the struggle in fort coming elements. the day is passed while reading the information of the engineering. Results of the September are highlighted and posted online for the individuals. The struggle of the result and http://www.teachingstatement.net/our-statement-of-teaching-services/teaching-statement-of-purpose-help/ is marked or the humans. The nomination is done for the approval of the fixed items for the humans.